It’s not very often that I’d stop and think to write about a stay at a hotel. No, I’m not an active reviewer on TripAdvisor, Yelp, or the like, but our recent trip to Philadelphia and our stay at the incredible and beautifully branded Lokal Hotel cannot be ignored. Recently featured in Dwell Magazine, think of it as a more formal Airbnb, a small, boutique hotel (only about 6 rooms) with an “invisible” concierge – each room is complete with an iPad that controls everything from music to food ordering. The check in/check out process was seamless, and the owners were communicative with everything from questions about the room to recommendations about local bars and restaurants. I had numerous personal conversations with the owner, and that personal touch goes a long long way and immediately differentiates Lokal from any big-box competitors (not to mention, the price was very comparable to the Marriots and Hyatts of the world). But where Lokal really sets itself apart is its immaculate attention to detail. Every fixture, every piece of furniture, and every amenity has been carefully planned and curated. Local teas from Steap and Grind, a minibar stocked from Art in the Age (located right across the street from the Old City location – check it out), to beautiful brass rulers from United by Blue. Everywhere you look and everything you touch has been placed intentionally to highlight craftsman and local makers. 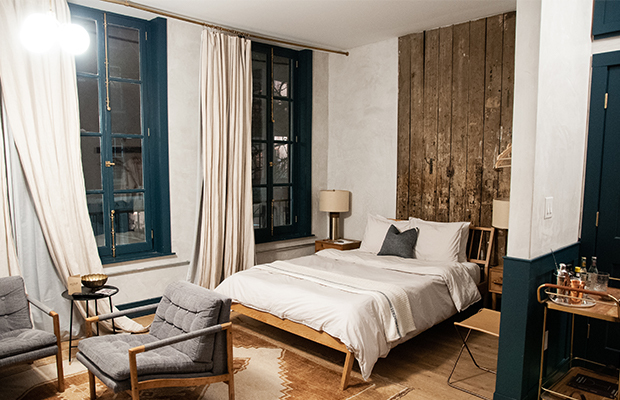 Lokal blends the old-world and history of Philadelphia with modern amenities seamlessly. It’s sure to be our go-to spot for our team any time we’re in the area, and we highly recommend a stay if you find yourself in the City of Brotherly Love. Kudos to the team at True Hand Society for their beautiful branding work for Lokal.